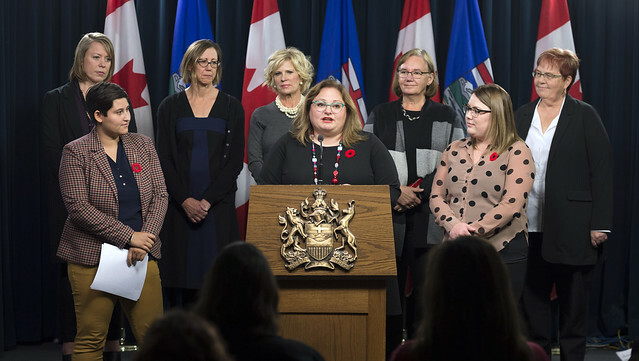 The provincial government is working to protect Albertans from sexual misconduct and abuse from regulated health professionals by introducing a bill that increases survivor supports and requires more transparency for regulatory colleges. Minister Hoffman stands with MLAs Cortes-Vargas and Drever along with representatives from the Association of Alberta Sexual Assault Services, Sexual Assault Centre of Edmonton and College of Physicians and Surgeons of Alberta to speak to new legislation to protect patients from sexual assault. After hearing from survivors and their allies, the government is taking action with An Act to Protect Patients. The bill would make penalties mandatory for sexual abuse and sexual misconduct by regulated health professionals, would require disciplinary actions to be clearly and consistently posted online, and would provide survivors with access to treatment, counselling and patient-relations programs. If passed, An Act to Protect Patients would enable Alberta’s regulatory colleges under the Health Professions Act to cancel practice permits in instances of sexual abuse and suspend them in instances of sexual misconduct, and would require colleges to create public websites that list health professionals’ discipline history for sexual abuse and misconduct. The legislation would also require that colleges provide funding for treatment and counselling for patient survivors. Health professionals found guilty of a regulatory offence would be barred from reinstatement for at least five years. If the bill is passed, Alberta would be the second province in Canada, after Ontario, to take targeted legislative action to protect patients from sexual abuse by health professionals, with new legislative requirements coming into effect April 1, 2019.